But what does it mean, proper care? Rug Insider talks with James Garner of Sharian in Atlanta, GA to find out. How frequently a rug should be vacuumed however is not so cut and dry. “Depending on the amount of foot traffic, the number of people using a rug, whether or not there are pets in the house such as dogs or cats, all factor into the frequency of a good thorough vacuuming,” states Garner who further advises that for a household of two adults and one shedding dog, once a week is probably sufficient. For situations involving more adults, children, multiple pets, or in situations where more dirt is tracked in or dropped on the floor, twice a week or more is often required. Regardless of the source of soiling however a rug should be vacuumed frequently enough as to remove dirt particles before they have a chance to penetrate beneath the surface of the rug. “The frequency is of course not uniform throughout the same household.” Garner adds, noting that formal living rooms which are only used for entertaining require less frequent attention. In short, if there is visible dirt, hair, crumbs and the like on the surface, it is definitely time to vacuum the rug. One final note on vacuuming regarding technique; a carpet should be vacuumed in multiple directions as to ‘flex’ the pile and help release dirt. Working with short medium speed strokes in one direction, typically up and down the length of the rug, pushing across or with the nap of the rug (this helps to avoid pushing dirt into the pile), vacuum the entire surface of the rug. Then turn ninety 90 degrees and repeat the process across the width. Vacuuming does more that just remove surface dirt and contamination, it also serves a remedial purpose of keeping the scourge of wool rugs everywhere at bay: moths. The larvae or caterpillar stage of the Common Clothes Moth, Tineola bisselliella, enjoys a diet rich in keratin protein which is found in two common rug materials, namely wool and silk. As the larvae are particularly fond of dark, damp, and quiet spaces with little to no air circulation, the best way to avoid moth damage to a rug is to remove moth eggs and larvae not only by regularly vacuuming the exposed areas, including the underside of the edges, but also seasonally vacuuming areas of the rug which my lie under larger furnishings such as a china cabinet, credenza, or sofa. Furthermore, as larvae are attracted to dirt—including sloughed human skin cells—weekly vacuuming helps prevent an infestation from beginning. Garner continues by adding a few caveats regarding vacuuming. Foremost is to avoid vacuuming the fringe of a rug, especially with the beater bar of a vacuum. The characteristic damage caused by vacuuming is telltale and while it can be repaired, is best avoided from the outset. Likewise, it is best to vacuum a rug or carpet using just suction, with the beater bar turned off, as to avoid pulling too aggressively on the pile, particularly with antique carpets with Garner also cautioning against using a vacuum that is too powerful, particularly with antique carpets. Another component of proper care involves rotating a rug at least once a year. This allows for areas of traffic wear and potential sun-fading to be evened out. Furthermore, while the rug is being rotated it can also be flipped face down to allow for a thorough vacuuming of the entire back of the rug, before being righted. The latter both dislodging more embedded soil and further guarding against moth damage. Regardless of even the strictest adherence to a routine of regular and seasonal vacuuming, any rug on the floor is going to eventually require a proper cleaning; this being done by any number of reputable cleaners located throughout the United States and indeed the world. Garner’s family operates one such establishment. 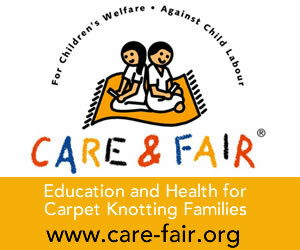 “The best estimate I can give is to say that a rug should be professionally cleaned every three to five years, two to three if there is heavy traffic.” For the aforementioned family with children and multiple pets this means having their rugs cleaned on the shorter end of that spectrum, except in instances where the room the rug is in is only occasionally used. While Garner was and remains happy to elaborate on the specifics of cleaning, for the layman and even the avid rug collector the specifics are of little concern other than to say it is best to entrust your rugs only to reputable cleaners. They can be found by asking a local rug dealer—who may also offer cleaning—for a recommendation, or by contacting a trade association such as the Association of Rug Care Specialists. “There are many steps of the cleaning process that are important.” says Garner, “But a simple soap and water wash is usually best, and I cannot emphasize enough how important drying is. It’s imperative to dry the rug quickly to avoid causing unintended harm.” A rug cleaner should also be able to treat any areas that may have been stained or discolored, and can affect repairs on areas of damage large and small, including repairing fringe damaged by inattentive vacuuming. Synthetic fiber rugs are often better for areas with very heavy traffic and can be very forgiving with store bought carpet cleaning solutions, though caution must be exercised as some cleaning agents can still cause damage. It is always best to follow the cleaning instructions of the rug itself and the cleaning solution, but if in doubt contact a reputable cleaner. Synthetics, especially any of the ‘poly-‘, olefin, or high-performance synthetics on the market are also excellent for those with incontinent pets. Rugs made of mixed fibers, particularly when wool is paired with synthetic or semi-synthetic materials, can be very challenging to clean as each fiber may require distinct cleaning regimens. Difficulty in cleaning rugs however is not confined to any one genre as Garner mentions Moroccan flatweaves often have an excess of unset dye which must be washed away. The “antiquingprocesses” used on some rugs can essentially end up reversed duringcleaning, sisal is almost impossible to clean and it is often cheaper to replace than clean, and that overall, low quality dyes tend to cause most of the trouble,to name but a few. For all the difficulties faced by those who clean rugs, it should be mentioned that when asked what rugs are easiest to clean Garner unknowingly joins in agreement with Lisa Slappey (see Flood Zone in this issue, pages 33-36) in stating that Karastan’s Axminster machine-made rugs clean well and retain much of their original appearance after cleaning. Even with the utmost of caution it is likely at some point in the life of a rug, something is going to be spilled on the rug and when this occurs it is best not to panic. As Garner notes, high performance synthetics are exceptionally forgiving to spills and soiling, as is wool and other natural fibers, though the latter require a bit of exercised caution. Blotting, not rubbing, to remove excess liquid is almost always the first step, but given the myriad of possibilities, it is impossible to explore them all herein. The manufacturer of your rug or cleaners such as Sharian are your best source for information on spot cleaning, with many offering convenient downloadable guides for use. Familiarize yourself with the steps in advance and build a small “emergency” cleaning kit as to be prepared before accidents happen. For the average rug and carpet owner, underlay, or as it is also called padding, is the final and third part—along with regular vacuuming and periodic cleaning—of what comprises “proper care and cleaning”. Garner mentions he recommends a product which is rubber on one side (to help hold the rug in place) and a compressed felt like material on the other (which provides cushion) adding “I prefer those made with natural as opposed to synthetic rubber as in my experience the synthetic rubbers can stick to various types of flooring.” Natural rubbers do tend to degrade over time and will have to be replaced periodically. As Rug Insider now turns for guidance to Dean Jerrehian of Jade Industries which has been making a variety of types of rug underlay and padding since 1972. According to Jerrehian there are two main reasons for using a rug pad. First, a good rug pad will provide a cushion between the rug and the flooring which will help prevent premature wear on the underside of a rug, thus protecting the lifespan of a rug and second, and perhaps more importantly, a rug pad can prevent accidents by holding rugs from slipping or buckling underfoot. A third point, one less critical to the care of the rug itself, but more toward the comfort of those walking upon the rug, is that a well-made rug pad is soft, luxurious and resilient, compressing underfoot and bouncing right back. Jade offers a variety of padding types from the composite fiber and rubber type padding preferred by Garner, to the perhaps more familiar open mesh variety, to finally a variety of thicknesses of their signature all natural open cell rubber padding personally preferred by this author. The reason for the variety is that different flooring types necessitate different padding needs and indeed some padding provides too much insulation against radiant in-floor heating, with Jade specifically noting their UltiMat and OptiMat, are “less desirable for the purposes of heating efficiently” in this scenario. Regardless, reputable rug dealers and cleaners should be able to advise on the padding type most appropriate for the given situation. If reading this litany of words answering the apparently simple question ‘But what does it mean, proper care?’ has seemed a bit tedious and like a lot of work, there is good reason. As Jim Garner said as RUG INSIDER discussed this topic with him, “Rugs require a bit of work.” Just like most of the finer things in life.